The African Union Charter on Democracy, Elections and Governance expresses the commitment of signatory governments to “human rights and democratic principles”. Many African nations that have signed or ratified the charter bind themselves to a representative system of government, and free and fair elections. As the African Union and international community work to support African countries to fulfil their commitments to democracy, the perceptions of ordinary citizens provide an important window on progress and remaining challenges. 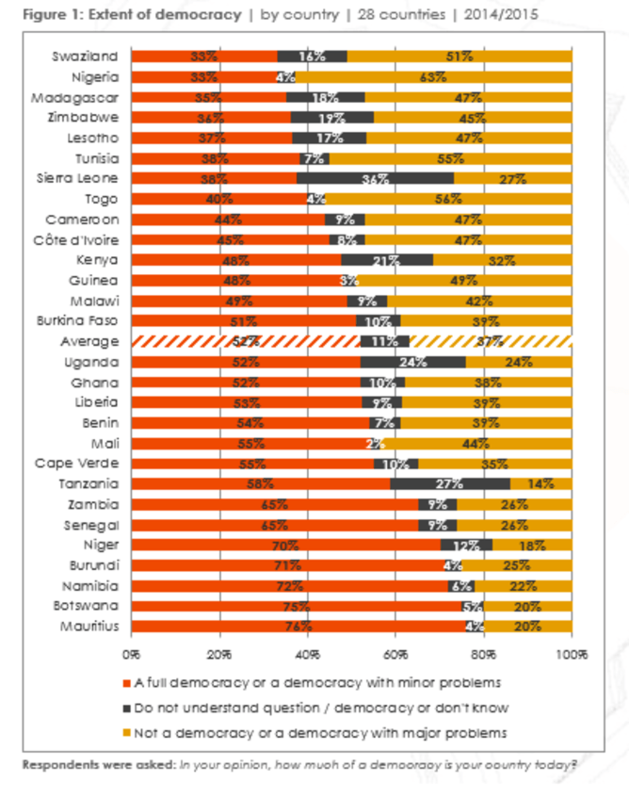 A new analysis by Afrobarometer, a non-partisan research network, released in observance of the International Day of Democracy, suggests the extent to which African countries put democratic ideals into practice varies widely. Afrobarometer is currently implementing its Round 6 surveys (2014-2015) in 36 countries across Africa, including many of the continent’s most democratic countries, but also many that are rated as only “partly free” or “not free” by Freedom House. As of now, Afrobarometer has data from the first 28 countries. Data from the remaining eight will be available later this year. Based on 41 953 face-to-face interviews in these 28 countries, the analysis shows that on average, barely half of surveyed citizens consider their country a “full democracy” or “a democracy with minor problems.” There are 54 countries in Africa. Less than half are “fairly” or “very” satisfied with how democracy is working in their country, a decrease from the previous survey round completed in 2011-2013. Other bedrocks of democracy, such as free and fair elections and freedoms of speech, association, and electoral choice, are not yet universal realities, the survey data indicate. On average, across the 28 surveyed countries, a slim majority (52%) of survey respondents perceive their country to be either a full democracy (18%) or a democracy with only minor problems (34%). A significant minority say they live in “a democracy with major problems” (27%) or “not a democracy” at all (10%). Countries differ considerably in the extent of democracy that their citizens perceive. Majorities give favourable assessments in 15 countries, led by Mauritius (76%), Botswana (75%), and Namibia (72%). This is reflected in Figure 1 below. But at the other extreme, only one-third of citizens in Swaziland and Nigeria share this positive assessment. Importantly, Nigerians’ negative assessments were captured in December 2014. This was some three months before the country’s historic electoral transition. On the flipside, Burundians’ relatively positive assessments were recorded in September and October 2014, before the violent 2015 election period. Overall, in ten of the 28 countries, more citizens say their country is not a democracy or is a democracy with major problems than hold the more favourable view. Satisfaction with democracy varies just as widely. Across 28 countries, only 46% of citizens say they are “very satisfied” or “fairly satisfied” with the way democracy works in their country (Figure 2). 43% say they are “not very satisfied” or “not at all satisfied”. 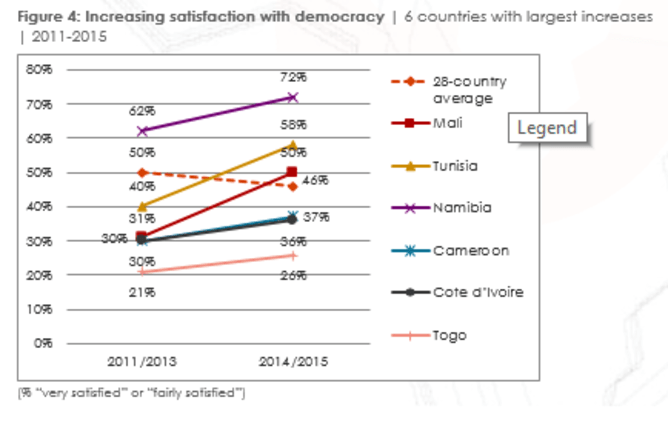 Satisfaction runs highest in Namibia (72%) and Botswana (68%) but falls below one-third of citizens in seven countries, including Madagascar (11%), Togo (25%), and Cape Verde (26%). 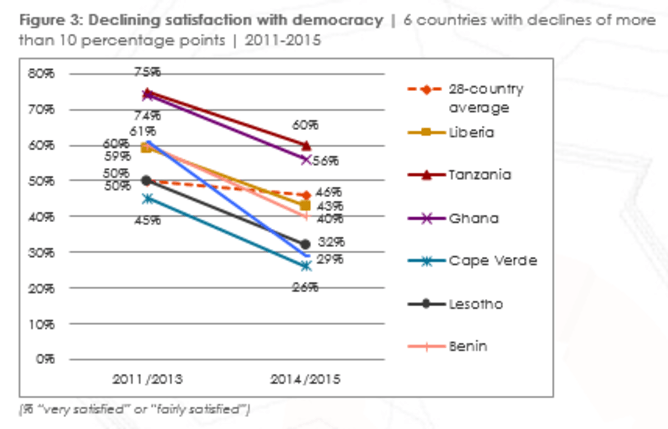 Across the same 28 countries, satisfaction with democracy decreased from half in the Round 5 survey in 2011-2013 to 46%. Seven countries saw declines in satisfaction of more than 10 percentage points. The most dramatic was a 32 percentage point drop in Sierra Leone (Figure 3). But, satisfaction increased markedly in six countries, led by Mali (a 19 percentage point increase) and Tunisia (an 18 percentage point increase) (Figure 4). A bare majority of 51% of citizens say they are “completely free” to speak their minds. Another 26% feel “somewhat free”, while 22% say they are “not at all” or “not very” free to say what they think. At 77% and 73% respectively, Malawi and Ghana top the list of citizens who say they enjoy complete freedom of expression in their countries. Majorities share this view in 18 of the 28 countries. Freedom of speech is perceived as most limited in Swaziland. Here only 18% of citizens say they are completely free. Togo came in at (26%), Zimbabwe (27%), Nigeria (28%), Burkina Faso (31%), and Côte d’Ivoire (31%). 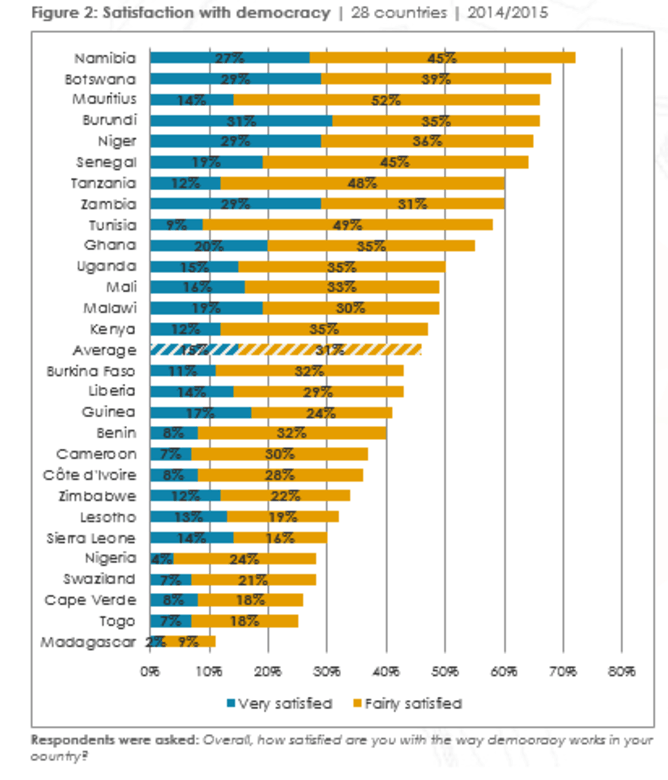 The most dramatic exceptions are Swaziland, where 73% of citizens say they do not enjoy freedom of association, and Zimbabwe where 41% say they are not free. Voting freedom is reported to be considerably more robust. Nearly three-quarters (73%) say they are completely free to vote as they choose, while 18% feel at least “somewhat free”. But, while 80% or more say they are completely free in 12 countries, in several others confidence is considerably more circumscribed. This includes Zimbabwe (35% completely free), Nigeria (49%), Côte d’Ivoire (54%), Burundi (55%), and Swaziland (56%). 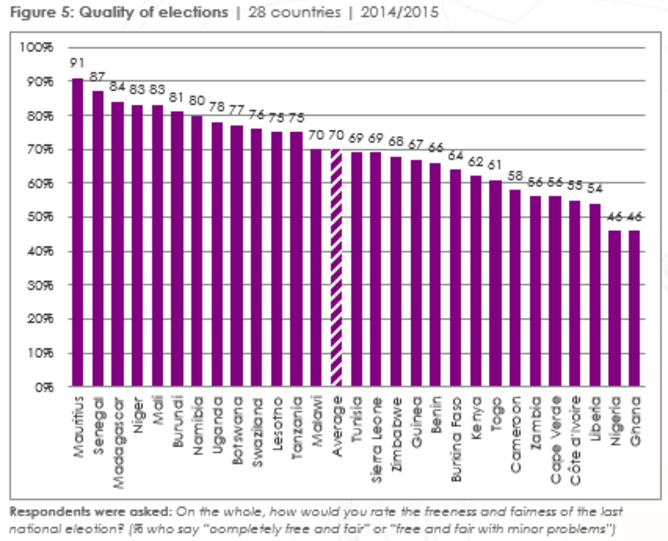 So while overall confidence in voting freedom is high, it is clear that citizens in a number of countries still face significant barriers to voting for the candidate of their choice.